Silver Jubilee Celebration of 1994 Batch. Lip smacking food and dinner from one of the most popular restaurants of Kolkata - ‘Tangerine’. Musical Performance by Kalla & Deene Khan from ‘Project Folk & Sufu Band’. DJ Harish will be there to groove you all! So, it’s not just a grand feast; it’s going to be a musical night! All of us are aware of the calamity that struck our state of Kerala. Over 82,000 people in Kerala have been displaced due to the floods that have ravaged the State. 324 have lost their lives between August 8 and 17, 2018 and More than 3.1 lakh become homeless and shifted to 2094 relief camps. We are very concerned and would like to pledge our full support and cooperation to the Jesuit Fathers who are already involved in intense relief work in remote and affected areas. I implore alumni/ae to come together, as conscientious citizens, in our endeavour to donate generously and assist and expedite relief work in Kerala. Our concerted effort will rescue our distressed brothers and sisters and restore cheer and smile to their lives. 1. 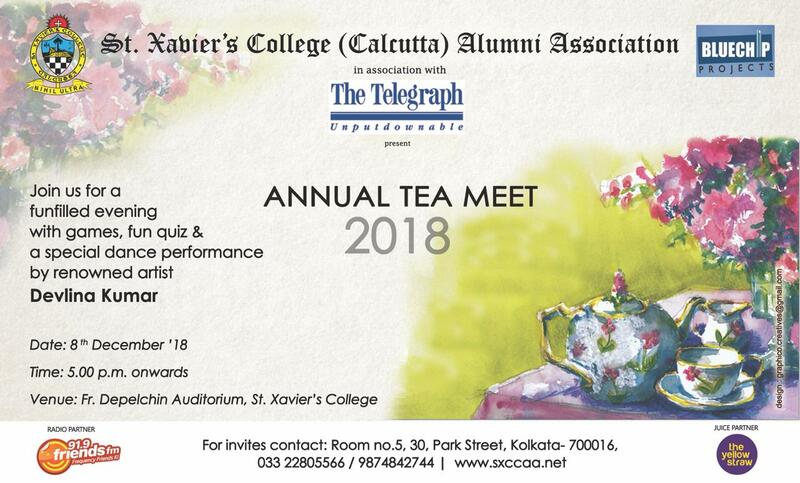 Cheques drawn in favour of St. Xavier’s College (Calcutta) Alumni Association. 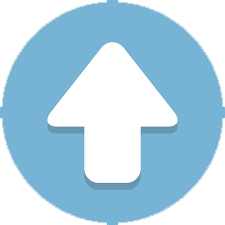 All contributions mentioned above are eligible for deduction U/S 80G of Income Tax Act. We shall keep you updated on our progress. Let us join in our prayers for Kerala. 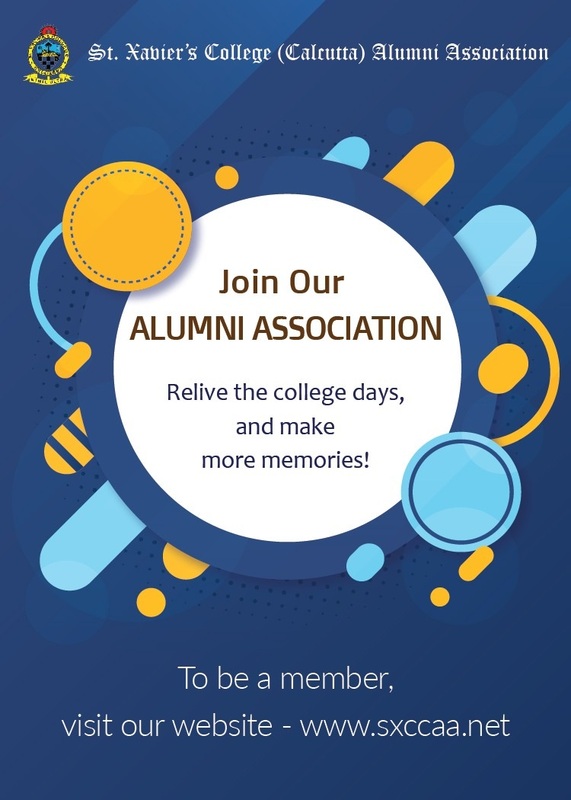 When we gather to refocus our dedication to various activities for the benefit of the marginalized students of rural schools and our college supported by the SXCCAA and / or by the Jesuit organizations – Coinciding with the Birthday of our President, Rev. Fr. Dr. Dominic Savio, S.J. 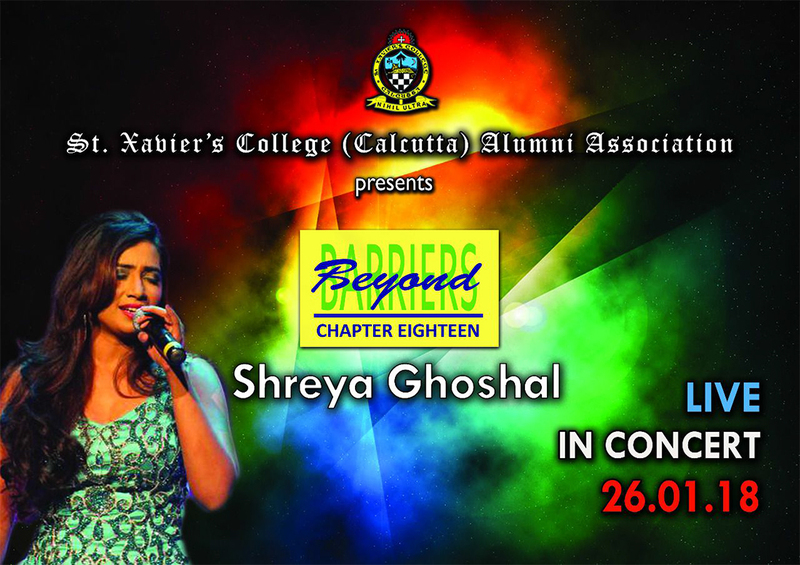 will be held on Monday, the 23rd of July, 2018 from 6.30 PM onwards at St. Xavier’s College Auditorium. The programme will be followed by high tea and snacks. Members (including spouses) are requested to send prior confirmation of their attendance by contacting 22805566/9874842744. We are pleased to inform you that we will be organizing a Programme on “Cancer awareness and prevention” on Friday 22nd June, 2018 at 6.30 pm in Room No 15 at St Xavier’s College. Dr. Chanchal Goswami , renowned Oncologist has kindly consented to grace the occasion as the Chief Guest and speaker . Fr. 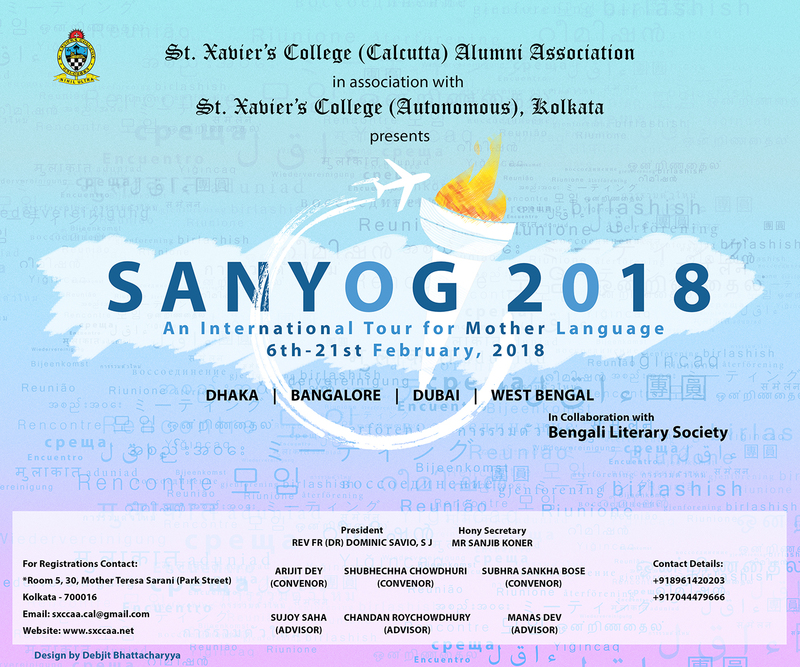 Dominic Savio, SJ, Rector and Principal, St. Xavier’s College (Autonomous) and President of St. Xavier’s College (Calcutta) Alumni Association will bless the event. As there are limited seats, we request you to please register your participation by calling to Room 5 (22805566, 9874842744) and take your seats by 06.15 pm sharp. Members are welcome to bring their spouses if they wish to participate in the programme. Rev. Fr. 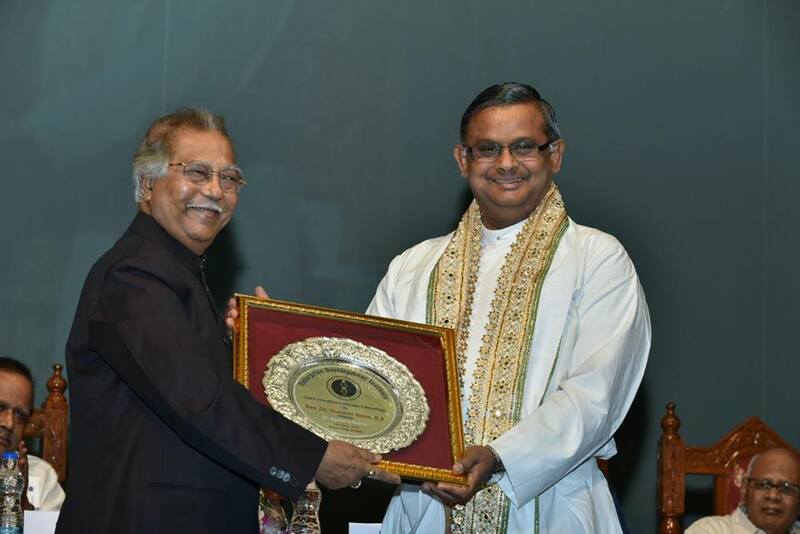 Dominic Savio, SJ, Principal & Rector, St. Xavier's College (Autonomous) Kolkata & President, SXCCAA, has been awarded with 'Excellence in Education and Philanthropy Award' by The Bengal National Chamber of Commerce & Industry at a ceremony held on 14th April, 2018, at Science City Auditorium. 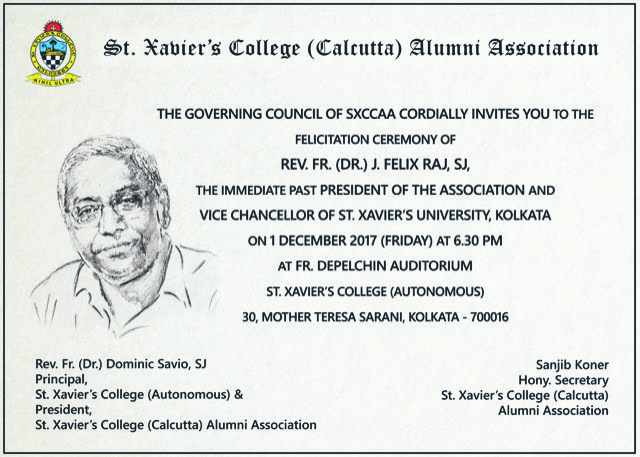 Father in his address dedicated this award to the 3 pillars of St Xavier's i.e. Students, Staff & Alumni. 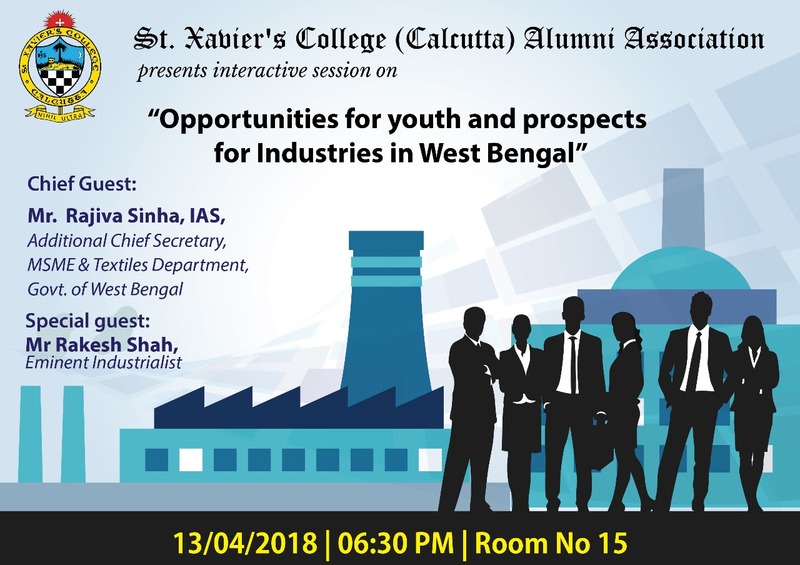 We are pleased to inform you that we will be organizing a Programme on “Opportunities for youth and prospects for Industries in West Bengal” on Friday 13th April, 2018 at 6.30 pm in Room No 15 at St Xavier’s College. Mr. Rajiva Sinha, IAS, Additional Chief Secretary, MSME & Textiles Department, Govt. of West Bengal has kindly consented to grace the occasion as the Chief Guest. Our own alumnus Mr. Rakesh Shah, an eminent Industrialist and Former Chairman EEPC would enlighten us on the subject. Rev. Fr. 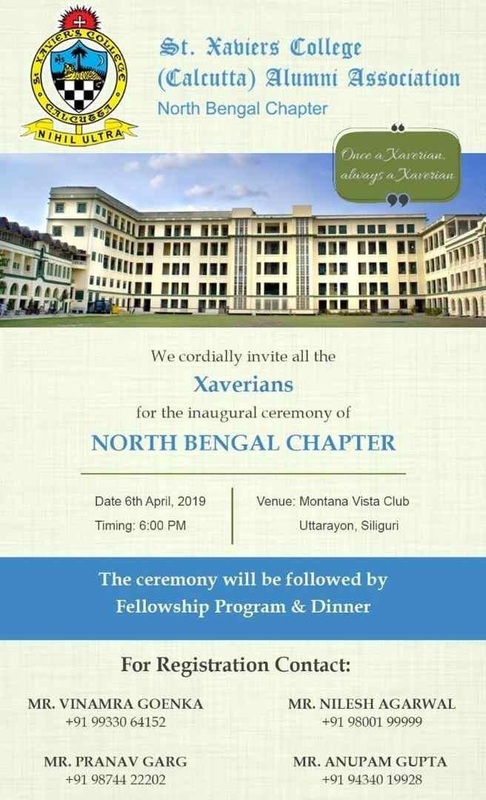 Dominic Savio, SJ, Rector and Principal, St. Xavier’s College (Autonomous) and President of St. Xavier’s College (Calcutta) Alumni Association will bless the event. As there are limited seats, we request you to please register your participation by calling to Room 5 (22805566, 9874842744) and take your seats by 06.30 pm sharp. Members are welcome to bring their spouses and adult children if they wish to participate in the programme. I am glad to inform you that the XXVII Fr. 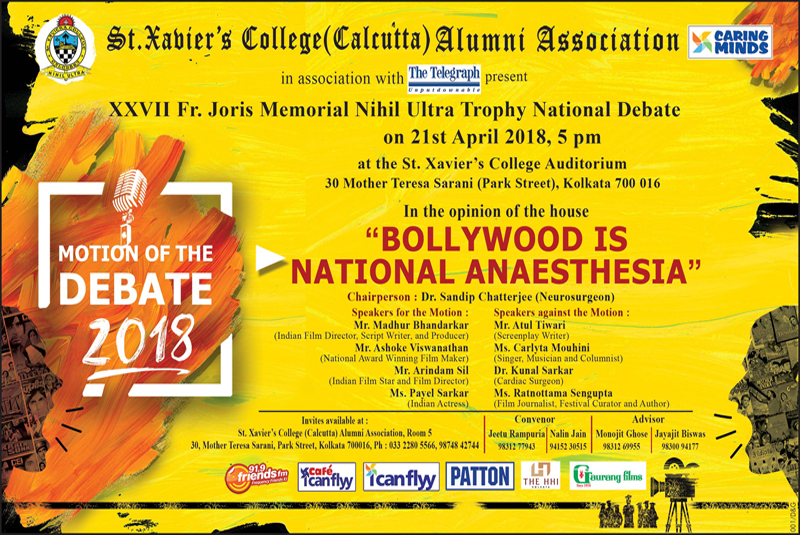 Joris Memorial Nihil Ultra Trophy National Debate will be held at the College Auditorium from 05.00 PM onwards, on Saturday, the 21st of April, 2018. 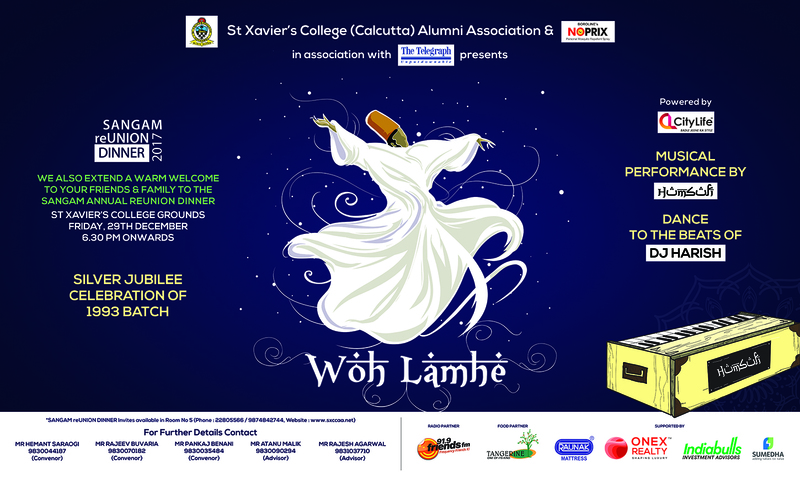 One of the most sought after in the Xaverian calendar of events and a forerunner in the debating circles of the city. In continuation of our journey to embark new vistas, this year we have decided to have a subject which has widespread impact on our social life. Entertainment is an integral part of our life and social periphery and hence this year the Motion of the Debate is, "In the opinion of the House, Bollywood is National Anesthesia". 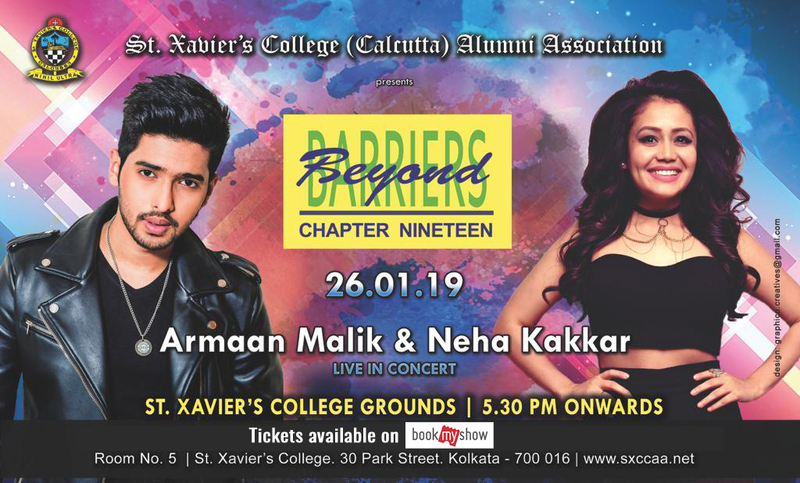 The organising team is working to get renowned personalities from various walks of life including of course from the entertainment world to present an evening full of enrichment for the mind and heart both. Members are requested to collect their Invitation cards from Room No. 5 from 14.04.2018 onwards to ensure their berth for the exciting evening.